What is slacklining and how did you get into it? Slacklining is the sport of walking on a thin piece of webbing. 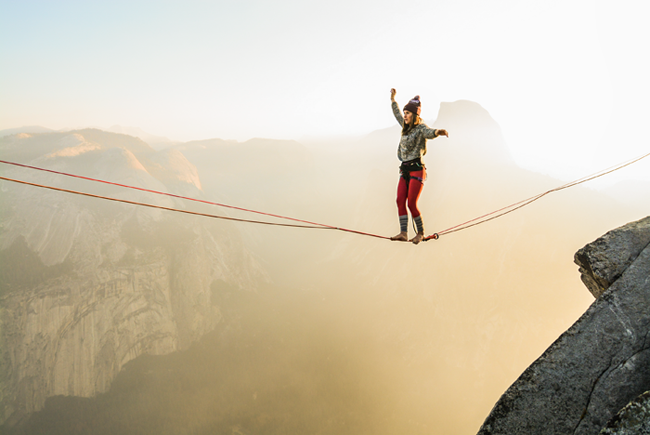 It’s not like a tightrope; it’s very slack and kind of feels like walking on a rubber band. We don’t use poles to balance. Instead, we use our arms and mind and breath to balance. I met someone in the park who was slacklining and he set up a little line for me, maybe 10 feet long, not even a foot off the ground. I immediately fell off, but I was hooked from the first step. The more I fell the more frustrated I felt, but I needed it in my life. I bought my own line that night and started going out to the park to practice. I really liked how it made me feel. What does it feel like to be on a highline? It’s spiritual almost. You see people really get into it and end up quitting their jobs and moving into a van and doing the festival circuit. When I started, I was getting outdoors more and I felt very calm; my head was more clear. It was kind of like a meditation. But it’s like a forced meditation, because if you think about anything else while you are walking that line, you fall off. A lot of people see what we do and think we’re adrenaline junkies, but it’s not like that. Most people who do it are terrified of heights. It’s about finding that perfect quiet in your mind. What physical training do you do to prepare? It’s a lot of falling. You just have to keep getting back up on the line, which is an awesome metaphor for life. I’m really into inversions and calisthenics and hand balancing and juggling. My husband [fellow pro highliner Ryan Jenks] and I have a whole gym in our living room and monkey bars in the hallway. We’ve made it a lifestyle of play and fun. That has made us very strong without having to commit to going to the gym every day. If you’re not afraid of walking across a highline, what are you afraid of? I definitely used to be afraid of lots of things, but highlining has changed my mindset in everything. It’s taught me that nothing can stop me. It makes me live my life to the fullest. If I can walk over a canyon, why am I scared of doing karaoke? Why am I scared of a job interview? That positivity just spreads to everything in your life. I wish everyone could experience it. You and your husband highline together. What has that meant for your relationship? It creates this special bond with that person, whether it’s a friend or a partner, because you’re entrusting that person with your life. If he’s rigging one line and you’re rigging the other, you need to be able to confidently say that this is safe, you can walk on this. Because you’re kind of facing death, it highlights what’s important in life. Do we want to waste our time on stupid stuff that doesn’t mean much to us? Do we want to waste our time fighting? No, we don’t.